The Expat Insider 2016 survey report, published by InterNations has revealed the friendliest and most welcoming countries. More than 14,000 respondents representing 174 nationalities and 191 countries or territories took part and had their say on moving, living and working abroad. In the ‘Ease of Settling In’ Index, expats were asked about the friendliness of the local population, the ease of making friends, how welcome they feel, and how easy and important it is to learn the local language. The survey results saw Mexico rank top as the friendliest and most welcoming country for the third year in a row. Respondents voted it as the easiest country to make friends as well as the second best country for being made to feel welcome. Almost eight in ten expats in Mexico (79%) find it easy to make new friends in general, while globally only six in ten feel the same. Over double the global average of 16% completely agree that it is easy to settle down in Mexico (33%). Although it only comes in fourth place this year in the Friendliness subcategory, 93% of expats are still happy with the general friendliness of the population. Only this year’s newcomer Taiwan beats Mexico in terms of friendliness towards foreign residents. Half of the expats in Mexico are extremely happy in this regard, over twice the global average of 24%. However, it’s a good thing that learning Spanish is generally considered easy by 63% of expats, as 43% find life in Mexico difficult without speaking it — slightly above the global average of 40%. After two years at sixth place, Costa Rica now ranks second for the ease of settling in. This is largely due to gains in the Language subcategory (21st to 12th place), although there was also a large jump in the Feeling Welcome subcategory (12th to 4th place). Nearly eight in ten expats (79%) feel “at home” in the local culture and four in ten (41%) are even completely satisfied in this regard, over double the global average of 18%. Another surprise to some will be how well Uganda ranked. It actually made a considerable jump this year from tenth to third place. The country either stayed the same or made gains in each subcategory of the Ease of Settling In Index. It is its excellent ratings in the Friendliness subcategory — where it is only surpassed by the newcomer Taiwan. About eight in ten expats (81%) find it easy to make new friends in general. 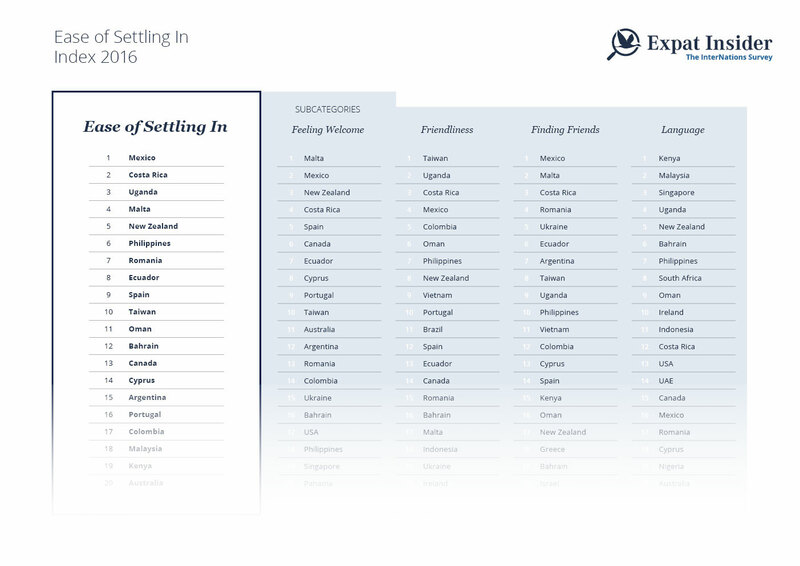 In Expat Insider 2015, Mexico, New Zealand, and Ecuador claimed the top three places in the Ease of Settling In Index. Whereas Mexico has kept its title for the third year running, New Zealand fell down the ranks a bit. At fifth place, New Zealand is three places lower in 2016. Why? It seems that expats in New Zealand are finding it a bit harder to make local friends. In 2015, only 18% generally did not agree that it’s easy to make local friends. This year, a full one-quarter of expats are of this opinion. The bottom three countries have remained fairly consistent over the past three years. Kuwait has always come in last, followed by Saudi Arabia. This year, Denmark is third from the bottom (it was fourth from the bottom in 2015 and 2014).